The current world recession and the potential recovery of some countries reveals all the weaknesses of the traditional “export market” – free trade – comparative advantage doctrines. Nowhere is this more evident than in the recent experience of Latin America. Despite recent popular upheavals and the ascent of center-left regimes in most of the countries in the region, the economic structures, strategies and policies pursued, followed in the footsteps of their predecessors particularly in relation to foreign economic practices. Influenced by the sharp demand and rise in prices of commodities, especially agro-mineral and energy products, the Latin American regimes, backed off from any changes in several crucial areas and adapted to the policies and economic legacies of their neo-liberal predecessors. As a result, with the world wide recession beginning in 2008, they suffered a sharp economic decline with severe social consequences. The resulting socio-economic crises provides important lessons and reinforces the notion that deep structural changes in investment, trade, ownership of strategic economic sectors is essential to stable, sustained and equitable growth. From the mid 1970’s with the advent of pro U.S. military and authoritarian civilian regimes and under the tutelage of U.S. free market academics and U.S. educated economists, Latin America became a laboratory for the application of free market-free trade policies. Trade barriers were lowered or eliminated, so that subsidized U.S. and European Union agricultural products entered unhindered, decimating local small farmers producing food for local consumption.Under the doctrine of “comparative advantage” policymakers financed and promoted large scale agro-business enterprises specializing in export staples – wheat, soya, sugar, corn, cattle, etc. betting on favorable prices, favorable market access and reasonable prices of food, farm equipment and non-agricultural imports. The total de-regulation of the economy and the privatization of public enterprises opened the floodgates to foreign investment, the takeover of strategic economic sectors and increasing dependence on foreign investment to sustain growth and the balance of payments. The overall strategy of the regimes was to rely on export markets, at the expense of deepening and extending domestic markets (local mass consumption); a policy which relied on cheapening local labor costs, and sustaining the high profits, of the agro-mineral ruling class. The latter’s presence in all the key economic ministries of the regimes ensured that the self-serving policies were given an ideological veneer around the notion of “rational efficient markets”, failing to note the long term history of built-in instability of world markets. The deregulated financial system and the world recession of 2000 – 2001, the savage pillage of the economy and treasury by the free market practioners and the monumental corruption and the unmitigated exploitation of workers, peasants and public employees produced region-wide revolts. A whole series of U. S. backed electoral regimes were overthrown and/or defeated in electoral contests. Ecuador, Argentina, Bolivia, Brazil, Uruguay, and Paraguay witnessed popular upheavals, which however ultimately led to the election of center-left regimes, especially in electoral campaigns promising “deep structural change”, including changes in the economic structure of power and substantial increases in social spending and land redistribution in the countryside. In practice the political defeats of the established right wing parties, and the weakened economic elite did not serve as a basis for large scale, long term socio-economic transformations. The new center-left regimes pursued socio-economic policies which sought to ‘reform’ the economic elites forcing them to accommodate to their effort to reactivate the economy and to subsidize the poor and unemployed. The political elites were driven from office, a few of the most venal officials implicated in mass repression were put on trial but without any serious effort to transform the party – political system. In other words the demise of the neo-liberal elites at the crises, induced by the free market policies, remained in place, temporarily held in abeyance by the center-left regimes state interventionist crises management policies. The new center-left governments adopted a whole series of policies ranging from economic incentives for business, financial regulations, increased expenditure on poverty programs, widespread wage increases and consultation with leaders of popular organizations. They repudiated the political enemies and perpetrators of the previous period along with the intervention in a few bankrupt private enterprises. These symbolic and substantive policies secured, temporarily, the support of the mass electorate and isolated and divided the more radical sectors of the popular movements. Nevertheless demands for broader and deeper changes were still on the mass agenda while the center left regimes attempted to balance between the radical demands from below and their political commitments to normalize and stimulate capitalist development, including all the existing elites (foreign multi-nationals, agro-mineral, financial, commercial and manufacturing elites). The dilemma of the center-left was resolved by the sudden upsurge in prices of commodities in large part stimulated by the dynamic demand and growth of the Asian economies, namely China. The center-left regimes abandoned all pretexts of pursuing structural change and jumped on the bandwagon of “export driven growth” – based on the export of primary products. Abandoning the critique of foreign investment and demands to ‘renationalize’ strategic private firms, the center-left regimes opened the door to large scale inflows of foreign capital – suspending the application of some of their regulatory controls. The commodity boom of 2003 – 2008 allowed the center left (and the right wing) regimes to “buyoff” the opposition: trade unions received hefty wage increases, business received substantial incentives, foreign investors were welcomed, overseas workers remittances were encouraged, as contributions to poverty reduction. In a word the entire socio-economic edifice of Latin America’s high growth export oriented strategy rested on world market demand and economic conditions in the imperial countries. Few of the economic experts, financial columnists and political celebrants of ‘rational markets’ expressed any doubts about the sustainability of the “export market” model. The extraordinary vulnerability of these economies, their dependence on volatile markets, their dependence on a limited number of export products, their dependence on one or two markets, their dependence on overseas remittance from the most precarious workers should have raised a red flag to any thinking economist and policy maker. The high priced consultants and overseas advisory missions drawn from the Harvard Business School, Penn’s Wharton School and other prestigious centers of higher learning (enamored by their mathematical equations which demonstrated what their premises assumed) argued that the least regulated markets are the most successful and convinced their Latin American counterparts from Center Left to Right to lower the trade barriers and let the capital flow. After only five years of export market induced rapid growth, the Latin American economies crashed. According to the United Nations Economic Commission for Latin American exports from Latin American and Caribbean nations in 2009 will show their steepest fall in more than 72 years (since the last world depression). The regions exports will decline by 11% by volume, while imports will fall by 14%, the biggest drop since the world recession of 1982 . The benchmark dates are indicative of the long standing commitments and vulnerabilities in trade structure: past and present recessions have an acute impact on Latin America because both now and in the past their economies depend on agro-mineral exports to imperial markets, which rapidly shift their internal crises to their Latin American trading partners. The historic decline in trade inevitably doubles and triples the unemployment rate among workers in the export sectors and has a multiple effect on satellite economic enterprises linked to spending and consumption generated by overseas trade. Specialization in agro-mineral exports limits the possibilities of alternative employment in a way that a more diversified economy does not. The dependence of the state for most of its revenues from agro-mineral and energy exports means automatic cuts in public investment and expenditures in social services. Latin America’s trade crises has especially affected those counties with the most traditional export product configuration in agriculture, mineral and energy commodities: Venezuela and Ecuador (oil) Columbia (oil and coal) and Bolivia have experienced as much as 33% decline in 2009, far above the average for the region. Mexico, dependent for 80% of its trade with the U. S. (oil, tourism, remittances, automobiles) experienced the biggest decline, 11% in GNP, of all countries in the hemisphere. While all export driven economies were hard hit by the crises those countries which had a more diversified trade mix, (manufactures, agriculture, services) dropped by nearly 20% while the countries which specialized in oil and mineral exports fell by over 50%. The counties with a greater diversity of markets and trading partners especially those which traded within the Latin American zone and with China experienced a smaller decline compared to those countries like Mexico, Venezuela and Central America which depended on the markets of the U. S. and the European Union which fell by over 35%. Trade was only one of the four fronts which impacted negatively on Latin America: Foreign direct investment, remittances from workers abroad, and commodity pricing contributed to the crises. Latin America’s open door to foreign investment (FI) was a major cause of the crises. FI flows escalated in response to the internal growth of Latin America, taking advantage of the high profits generated by the commodity/trade boom. With the decline in trade, income and profits, FI exited, repatriated profits and disinvested, exacerbating the crises and increasing unemployment. FI follows the practices of easy entry and fast withdrawal – a highly unreliable and volatile agency for development. Latin American regimes took for granted and built into their economic policies and projections multi-billion dollar transfers of income from overseas workers, overlooking the highly vulnerable legal and economic position of their citizens working abroad. The vast majority of overseas workers are in very vulnerable positions: many are undocumented (“illegal immigrants”) and during recessions or economic downturns are abruptly fired. Secondly they work in sectors like construction, tourism, gardening, and cleaning which are hard hit by recessions. Thirdly they have little or no seniority and are “last hired and first fired”. Fourthly, many are not able to collect unemployment insurance and face deportation if they cannot support themselves. The results of the high vulnerability of overseas workers are visible in the multi-billion dollar decline in remittances to Latin America, exacerbating poverty and tilting the balance of payments in the red. By putting all of their eggs in the basket of high commodity prices and overseas markets, the governments of the center-left lost a great opportunity to deepen their internal market via import substituting industrialization, agrarian reform and public investments in infrastructure linking agricultural – mining – manufacturing and energy sources in a “grid” to protect the national economy from externally induced crises. Throughout the first decade of the new millennium the newly minted center-left regimes railed against neo-liberalism and even identified themselves as “21st century” socialists. In practice what this meant was hitching increases in social expenditures to the existing economic structures and trade policies, with some adjustments in trading partners, and in some cases “joint-ventures” with foreign investors. Throughout the period the entire range of regimes practiced social liberal policies familiar to observers of contemporary European social democratic regimes: they combined free trade and an open door for foreign investment with greater spending for anti-poverty programs, unemployment benefits and increases in the minimum wage. On the other hand vast profits accrued to the agro-mineral elites and to the banking sector which financed trade, consumer consumption and debt roll-overs. The entire social liberal model rested however on the fragile foundations of the crises prone commodity export strategy, highly volatile trade revenues and income from vulnerable overseas workers. When Latin export markets dried up and commodity prices fell, revenues declined and workers were laid off. The social liberal model collapsed into negative growth and the previous gains in employment and poverty reduction were reversed. Several important lessons can be drawn from the ongoing experience of social-liberal regimes. 1. Positive social programs are not sustainable without structural changes which lessen external vulnerability. 2. Reducing external vulnerability depends on public ownership of the strategic economic sectors in order to avoid capital flight, typical behavior of foreign based capital. 3. Reducing economic vulnerability depends on diversifying markets away from crises ridden, financially controlled imperial centers. Greater economic sustainability depends on deepening the internal market, increasing inter-regional trade and redirecting trade toward high growth regions. 4. Social expenditures are necessary immediate palliatives but do not go to the root of poverty and low incomes. Far reaching land distribution programs linked to large scale development financing and investment in local food production and in domestic industries which complement and link up with agro mineral production will lessen dependence on overseas markets and stabilize the economy. 5. State control of foreign trade and strategic mineral enterprises allows for the capture of the economic surplus to finance economic diversification and innovation. 6. Regional integration has to pass from rhetorical declarations to actual performance and practice. Venezuela’s President Chavez, the leading advocate of regional integration and promoter of Latin American Bolivarian Association (ALBA), still depends on the U. S. markets for 80% of its sale of petroleum and 70% of government export earnings from petroleum, and over 50%of its food imports from U. S. military client Columbia. Regional integration is feasible based on planning complementary investments, and joint public ventures in industrializing mineral,petrol and other primary commodities. 7. Joint security pacts among and between Latin American regimes aimed at countering the U. S.-Columbian military bases and the U. S. militarization strategy can also have an economic function – creating joint venture armaments industries and reducing outside purchases. 8. Diversification of trade to Asia and lessening dependence on the U. S. and EU is necessary but insufficient if the export content continues to be predominantly primary commodities. Changing trading partners but perpetuating “colonial style” trading patterns will not decrease vulnerability. Latin America especially Bolivia, Brazil, Peru, Ecuador must insist that their primary products are industrialized and value is added before they are exported to China, India, Japan and Korea. 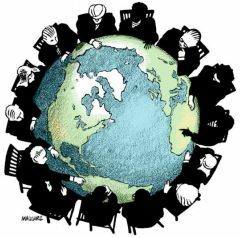 In summary the current world crises reveals the limitations and unsustainability of the social liberal policies and regimes. Recognition of the vulnerabilities and volatility lays the groundwork for a more thorough structural transformation based on changes in land tenure, trade patterns and ownership of strategic industries. The current crises has discredited both the neo-liberal and social liberal prescriptions and opens the door to new thinking that links social expenditures with social ownership.